THE INTERNET IN THE UK - Words that we never saw coming together: ‘Get Games’ and ‘Charity’ - what with our tight-fisted Scottish owner and his world view - but here we are with what we hope will be the first of many littleBIGbunches of fine indie games that the gamer decides how much they pay – and how much of their money goes to the Developers and to the GamesAid Charity (http://www.gamesaid.org/index.php). Running until January 2, littleBIGbunch brings five cracking indie games together into one bunch of digital loveliness that is so nice we want to cuddle it and give it a safe warm home to live in for ever and ever! ‘Slide to decide’ here: http://www.getgamesgo.com/little-big-bunch. All you have to do is ‘slide to decide’ how much you are going to pay and where your money goes. Much to the disgust of our Boss, it does not go to Get Games. 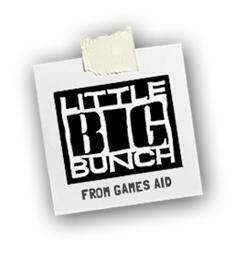 We are just chuffed to bits to provide the platform for littleBIGbunch on behalf of GamesAid and these awesome Indie Developers. So over to you. You know what to do! GamesAid is a charity working within the UK Games and Interactive Entertainment Industry and acts as a means of giving something back on behalf of the industry. It is a non-trading body administered by Trustees and formally run by a chairman. Funds are raised in a number of ways by folks in the games industry from games packs, marathons, abseiling off buildings, sailing the Atlantic, various sporting type activities, baking Christmas cakes and anything our members can think of and they’re a pretty creative bunch. For more information please go to www.GamesAid.org - GamesAid is registered charity 1081706. Founded in 2009 as an independently owned digital publishing, marketing and distribution platform. Headquartered in London, Get Games specialises in digital download, content creation and eating toasted marshmallows in winter.